Course Description: Riemannian geometry is the study of smooth manifolds equipped with a Riemannian metric. With this additional structure one is able to define geometric concepts such as geodesics, connections and curvature. The Riemannian geometer frequently explores the relationship between these concepts and the topological and differentiable structures of the underlying manifold. For example, the celebrated sphere theorem tells us that if M is a compact, simply-connected, smooth manifold of dimension n that admits a Riemannian metric g with sectional curvature satisfying 1/4 < Sec(M, g) <= 1, then M is homeomorphic to Sn. As a corollary we can conclude that the universal cover of any compact manifold which admits a Riemannian metric g with 1/4 < Sec(M, g) <= 1 must be a sphere. This course will serve as an introduction to this classical and vibrant area of research with an aim towards developing both theoretical and computational proficiency. It should be of relevance to students with interests in geometry, topology and (mathematical) physics. The topics covered will include some of the following. 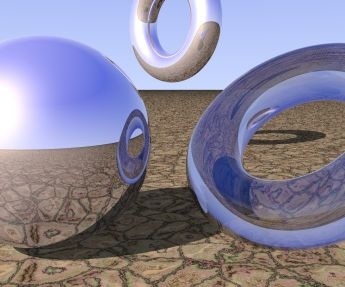 Riemannian Basics: Riemannian metrics; Affine & Levi-Civita Connections (Christoffel Symbols); geodesics, the exponential map, and the geodesic flow; curvature tensor, sectional curvature, Ricci & Scalar curvature; Curvature on compact Lie groups; Killing Fields. Computations: Computation of Riemannian basics on surfaces of revolution, Sn, Lie groups, RPn, CPn and other homogeneous spaces, and warped products. Geometry of Isometric Immersions: Immersions; The second fundamental form; Principal directions & curvatures; totally geodesic submanifolds; Sectional Curvature & the Gaussian curvature of surfaces; Minimal surfaces; The equations of Gauss, Ricci and Codazzi (i.e., the fundamental eqs.). Jacobi Fields \& Interpretations of Curvature: Jacobi equation and Jacobi Fields; Curvature and the spreading of geodesics; Conjugate points and singularities of the exponential map. Variations of Energy & Geodesics: 1st and 2nd Variation Formulas; Geodesics are locally minimizing; Theorems of Bonnet-Meyers and Synge. Spaces of Constant Curvature: Theorem of Cartan on Curvature and Metrics; Space forms \& totally discontinuous group actions. Manifolds of Negative Curvature: Existence of closed geodesics; Preissman's theorem; Non-existence of Killing fields; Ergodicity of the geodesic flow (optional). Isometry Groups & Isometric Actions: Isometry groups as Lie groups; Killing fields; group actions; action/fundamental vector fields. The Geometry of Riemannian Submersions: submersions; the A- and T-tensors; O'Neill's formula; Principal Bundles \& Connections. Prerequisites: Familiarity with smooth manifolds (i.e., Math 124 or the equivalent). Disabilities: If you have a disability and require disability related accommodations please speak to me and Cathy Trueba, Director of Student Disability Services, in the Academic Skills Center as soon as possible, so we can find a remedy. Office Hours: Office Hours are a good time to flesh out material you're having trouble with or to go beyond the syllabus. Please don't hesitate to stop by in either case. Homework: Homework will be assigned and collected every fortnight. You are encouraged to work together, but the solutions should be your own. No late homework will be accepted. A. Homework: I encourage you to form study groups to discuss course material and homework problems. However, the assignments you turn in should be in your own words and handwriting. Also, the names of others you consulted with should appear at the top of your assignment. B. Exams: You should not give or receive help during exams. All exams are closed book unless otherwise stated. (Tentative) Grading Policy: Your course grade will probably be determined by the following scheme. I will announce the definitive grading guide in the coming weeks. Topics: Review of Smooth manifolds. We'll use this hour to help people new to manifolds catch up. Topic: Riemannian submersions & group actions; Riemannian submersions, horizontal lifts and geodesics.